The Vegan Stoner: Order The Vegan Stoner Cookbook today! Order The Vegan Stoner Cookbook today! YES! Cant wait, this comes out on my birthday sooo birthday gift to myself perhaps? ;) haha gonna be good! Wow- I can't wait for this to come out! Quick question, will there by any new recipes in here that we haven't seen yet? 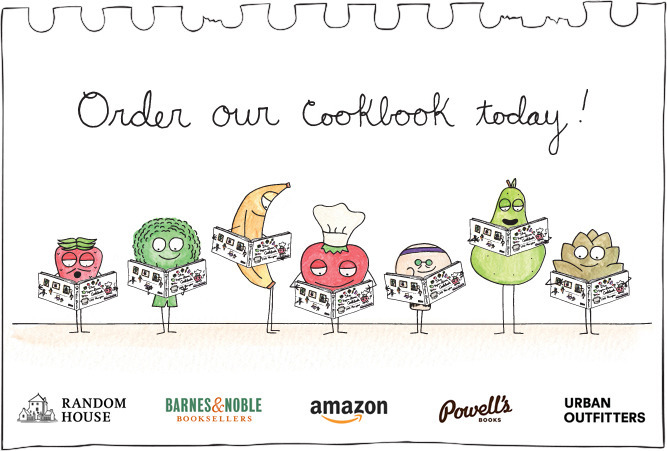 There are about 80 never-before-seen recipes out of the 100 recipes in the book. The recipes that are not new, have been updated and modified slightly. There will be a photo for every recipe, along with new illustrations of ingredients. It's like having our blog with new material at your fingertips. The book looks great! I want a copy for my daughter's 35th birthday (Sept 6). She cannot cook! I am not exaggerating. Although still unmarried, over the years most of her significant others have been cooks, one was a chef! She lives 150 miles from me so I will prepare and freeze dishes for her. Your recipe presentation is wonderful for a visual learner like myself. Given that the release date is September 3, if I order now do you know when I will receive a copy? If you pre-order the book now through Amazon, you can select "Release-Date Delivery" to have it delivered on its release date, September 3rd. Just out of curiosity, will this publication include the recipes from the snack book? This publication will not include any of the recipes in the Vegan Stoner Snack Book. We wanted to make sure those that supported us early on had something unique and exclusive. We will soon be done creating a second edition Vegan Stoner Snack Book. This edition will include all the recipes in the first edition with the exception of one recipe. There will also contain 4 never-before-seen recipes, as well. I have been waiting for this. I have ordered 3 copies. Hello! I was one of your testers. Im so excited for this book. Will it be available as a iBook? Our book is available as an iBook and can be purchased at this link >>. Just in time for Vegan MoFo - mine came in the mail today! Just got mine in the mail yesterday...amazing! Just got mine in the mail, I absolutely LOVE it!! Hi, will this be available in the UK? I just received my cookbook this week. It is so great. I already transferred all my notes from making some of the recipes. Thank you for making a vegan cook book that is not only easy but also has photos and easily obtainable ingredients. Since becoming vegan I have found it really hard to find that combination provided in your blog and book. Photos are my biggest complaint but you guys rock for all the photos! Maybe you all can make a holiday cookbook broken into various holidays and the vegan stoner version of traditional dishes - like the green bean casserole. Thank you to everyone who took the time to take a look through our book. We really put our best effort into making it. Thanks also to everyone who left such nice comments on the Amazon product page. It means a lot to us. This is fantastic, your illustrations are quirky, hilarious, and most importantly informative!! I wonder if it's too late to request this as a post-holiday gift.. Thank you for all that you do, and I hope you have a wonderful holiday and new year. Looking forward to what 2014 brings! I bought it! It is great looking! Don't know how took me so long to realize you had a book now! IMMEDIATELY ordered. So excited. I keep renewing it from the library because I'm unemployed right now but have made soooo many recipes from it already! Over 25 years of a vegan lifestyle and this is my fav cookbook. I live in no man's land but I hope this book is being sold at Clintonville Community Market in Clintonville, Ohio (Columbus). Please get it there and I'll splurge on it! Fantastic! I just bought this as a present for my husband in our local store, Tahoe. We love it, specially because it has a part where specifies how to replace ingredients to make every recipe vegan. Very helpful since we are introducing ourselves on this hole new world of food. I just bought your book, and am disappointed that most of the recipes on this blog aren't in it. Here was our thinking: If we have 100 recipes on our blog, and we published those same 100, then you have 100 total possible recipes from us. If we have 100 on our blog, and 80 new ones in the book, then you have access to 180 recipes from us. Hi, will this be available in INDIA. Our publisher, Random House, handles our distribution, so we don't have a specific answer for you. However, if the book is not available in bookstores in India, it is definitely available through Amazon India at this link.